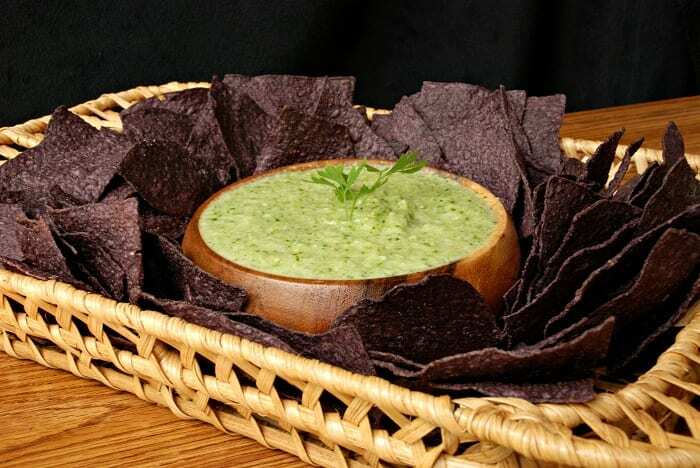 This Salsa Verde is a wonderful alternative to the classic tomato salsa. It’s packed with green tomatillos, onion, jalapeno peppers, herbs, and so much more. Have you tried this version of a salsa? I’ve tried salsa verde for the first time at Moe’s and I thought it was pretty good. Of course, it was a little too spicy for me, so I couldn’t exactly dive into it as much as I’d like to. I needed to recreate it but for my own “weakling” taste. So I got some perfect tomatillos at the farmer’s market and decided to make my own. I am now in love! I don’t know if I will ever eat regular salsa ever again! 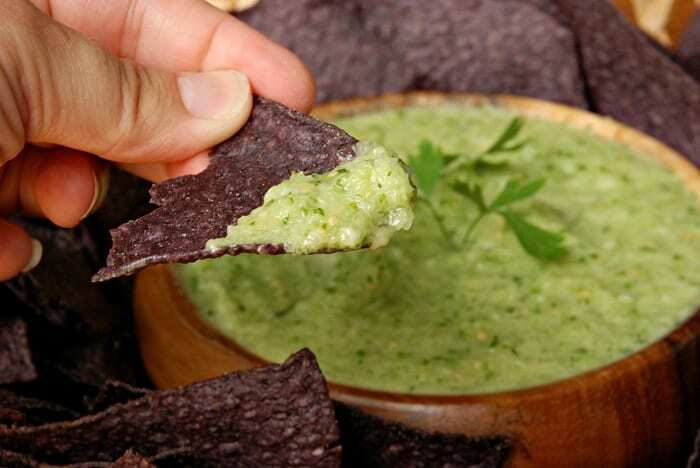 The flavors are so crisp and refreshing, it’s a wonderful salsa for any occasion. Oh, and don’t think that you can use this salsa only with chips, try adding it over some grilled chicken or fish. Add it to chicken breast and cook it in the crock pot, then shred it and eat with tacos. 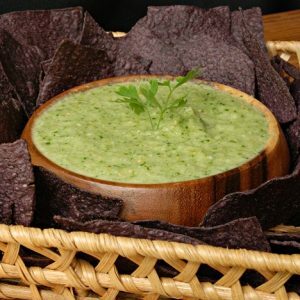 Just add a little on top or cooked together with meats and this salsa verde will add some fabulous flavors. Possibilities don’t stop there, top off your tacos and enchiladas with it for more zest. Make sure to remove husks from tomatillos and wash them well before preparing salsa. Cut veggies into chunks so it blends easier. Place all the ingredients in the food processor and blend well. That’s it, that easy. Store in a glass container with a lid, in the refrigerator. Beautiful, refreshing, and crisp salsa verde is made with tomatollos, jalapenos, onions, and herbs. Place all the ingredients in the food processor and blend well. That's it, that easy. Originally published on Will Cook For Smiles on September 18, 2012. That looks yummy! I have yet to buy tomatillos. One of these days I need to do that, and use your recipe. Looks delicious! I can’t wait to try your recipe! I love salsa verde but have never been brave enough to try it at home – but this looks like I could make it too! Pinning this one! My husband would LOVE this…have to try it! !